This little dish reminds me of my mom. When I was in high school, we went for lunch to the restaurant where she worked, a great little place with a cozy atmosphere and a Mediterranean flair. She recommended the Crab and Asparagus Melt to me, saying that it was one of her favorites, and knowing that we shared a love of seafood. I tried it and LOVED it. That little melt became something we bonded over and I remember requesting we go back for them on a few occasions. I even recall taking her there one Mother’s Day, just her and I to have our favorite lunch. Recently, that restaurant closed down and a new one moved in. I was a little crushed upon hearing this, as I hadn’t had an original Crab & Asparagus Melt in years. I decided I had try and make one at home. Here we have warm, chewy naan bread with crispy edges, a creamy tzatziki crab layer, some fresh green asparagus spears and a layer of melty, gooey cheese. This makes for a great meal alongside a salad but I also think that cut into wedges it would be an awesome appetizer. Mom, I think a visit my way is in your future…I know exactly what I’ll make us for lunch. Mix crab, tzatziki and onion together in a small bowl. Spread on naan breads. 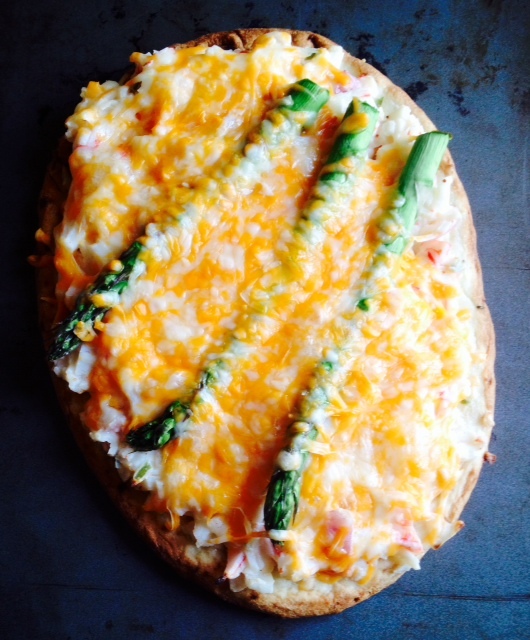 Lay asparagus overtop of crab mixture and sprinkle cheese on each naan bread. Bake for 10-15 minutes or until cheese is golden and edges of naan are crisp. Let cool for a few minutes before cutting.